New Delhi: Normal life was affected in National Capital on Monday due to the Bharat Bandh called by Opposition groups over rising fuel prices. Some shops and business establishments including banks and educational institutions were closed in some parts of the country. 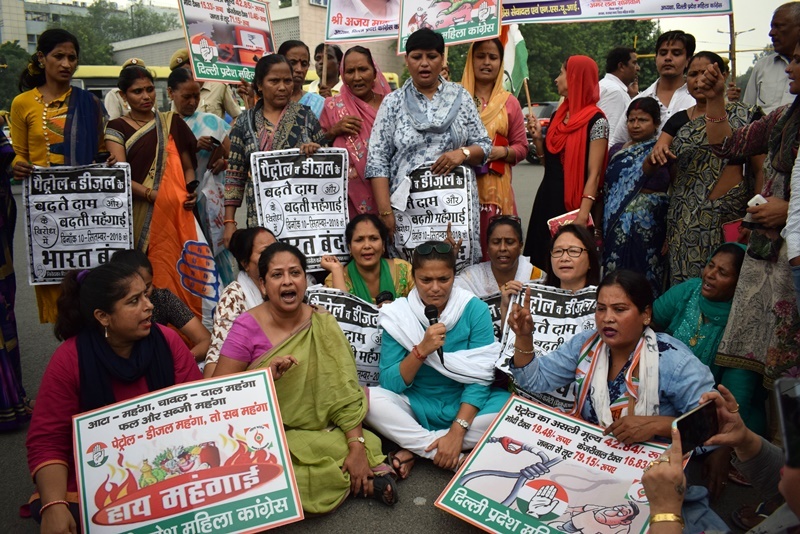 Delhi Mahila Congress on Monday staged a protest at ITO Chowk, Delhi regarding price hike in Gas, Diesel and Petrol prices. Fuel prices have been witnessing a hike in several states across the country over the past few weeks which has enormously effected the common man said, Congress leader Sharmistha Mukherjee. She further said, “Shockingly there are more number of police than protesters. Delhi police would do well to show such alertness to stop rising crimes against women in Delhi rather than stopping their peaceful agitations. Shame on Modi Government and Delhi police,” added Mukherjee.